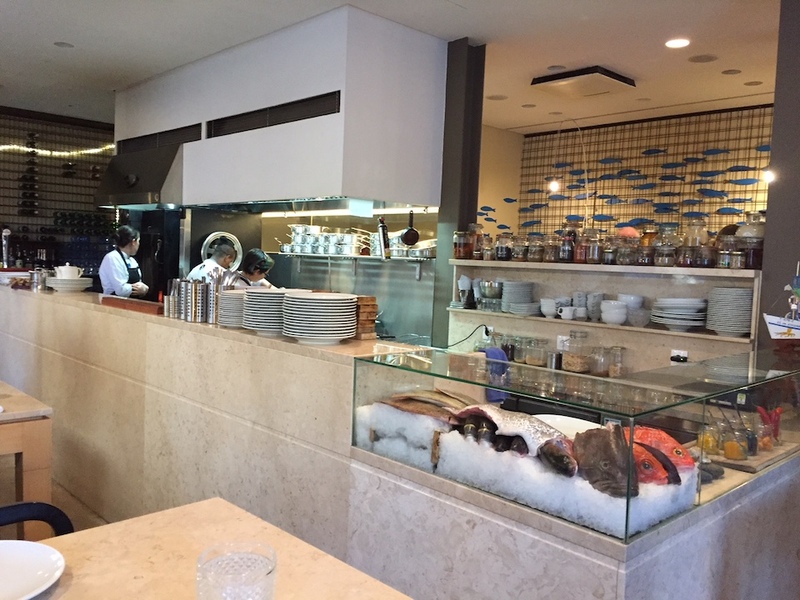 Excellent super-fresh seafood: wonderful oysters crab, shrimp, barnacles. Their dressed crab appetizer is deservedly famous. The less elaborate dishes that let the seafood dominate are best. 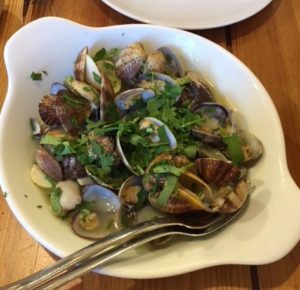 I was a fan of the Clams Bulhão Pato, not swimming in butter and garlic as in other traditional restaurants; instead, the dish combined clam broth, butter, lemon, garlic, parsley, and other spices in perfect balance. The old: Clams ao Bulhão Pato. At the time, Campo Ourique was best known as an aging neighborhood, both demographically and in terms of housing stock, much of which — like the rest of Lisbon during the economic crisis — had fallen into disrepair. It was ill-served by public transportation. The closest Metro station, Rato, was about two kilometers away, and most of the bus lines that passed through shut down early at night and/or didn’t run on weekends. As befitting its name, which translated to Corner Tavern, the restaurant drew its customers from Campo Ourique and surrounding neighborhoods, most of whom drove or walked there. They were known to the waitstaff. Families celebrated milestones with a dinner out, and each night we were there, at least someone had a birthday. Because we were obviously visitors, Richard and I tended to get the worst tables. In fall 2012, an unusually cold season, that meant the tables in the anteroom, by the door. On warm days in late spring, we were seated in an interior room next to the bathrooms. Even though this made us feel like outsiders, the quality of the meal was worth the less-than-comfortable conditions. The new interior is all white walls and sleek lines. Only the fish tank remains. 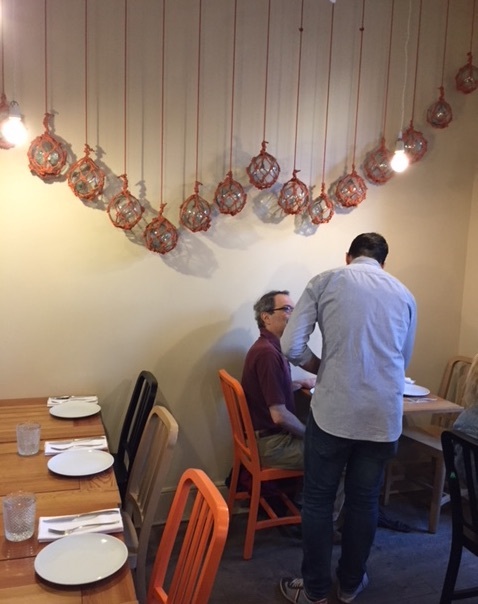 We decided to check out the restaurant’s new incarnation and in doing so, saw in a microcosm the effects of gentrification and the tourism boom in a remote corner of Lisbon. Gone were the yellowed and cracked tiles, replaced by a sleek modern interior. We were seated at a prime table next to the window, and as the restaurant filled, multiple languages — English, French, Spanish, German, Swedish — had replaced Portuguese as the dominant one. 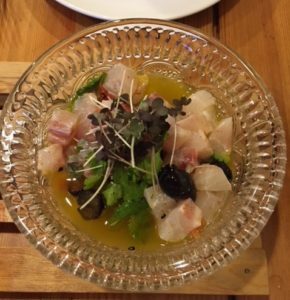 Even the Portuguese-speaking couple was young and hip, a far cry from the multi-generational families that once frequented this neighborhood restaurant. While the Clams Bulhão Pato and dressed crab appetizer remained on the menu, and were excellent as always, we ordered a ceviche appetizer for the first time. The old customers would have been shocked, but they no longer came. In 2012, the restaurant was a bit on the expensive side for a traditional tasca, and the prices for the same dishes had now risen another 20%, in line with other restaurants that primarily appealed to tourists and young Portuguese diners who’ve benefited from the economic recovery of the past few years. Richard hears about the changes to the neighborhood. The locals who once frequented this restaurant now go elsewhere, and I think of them watching the restaurant slowly become something unrecognizable to them. But the neighborhood itself has changed as well, and many of the people who once called it home have been forced by rising rents into places outside the city of Lisbon. At least in Portugal, the gentrifiers seem to be young Swedes, who move into aging or distressed neighborhoods and fix up the buildings to use as second homes or investments; according to our friends, the trend apparently began in Porto and has now moved to more remote corners of Lisbon like Campo Ourique. Hence the Scandinavian presence at this revamped restaurant. We’ve come to Portugal every year for six years, and the transition from the economic crisis to a tourism-fueled economic boom has been unusually sudden and, in the words of Portuguese friends, “aggressive.” Like gentrification everywhere, it has provided economic opportunities for many people — not all of them Portuguese, unfortunately — while pushing others further to the margins. With every benefit, there is a corresponding loss. This loss includes traditions and rituals tied to people, place, and a way of life. In the midst of enjoying what is new, it’s important to honor and preserve what used to be. Ah, Lisbon. What a fascinating city. I wish we could come visit you–and eat out–this time around. It has changed so much since the last time you were here! You saw some of the changes in Porto, but Lisbon seems to have moved ahead in the process.